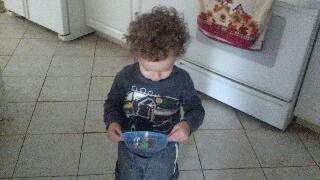 Mail4Rosey: A Big Welcome to: My Adventures With My 2 Kids! Yes, its here!!!! 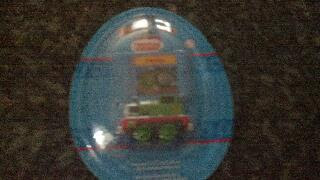 Finally Percy from Thomas the Train my son has been asking about all weekend and hubby ordered it for him on Saturday. 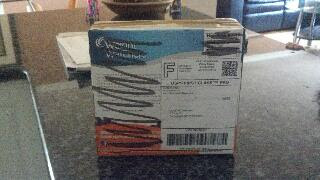 He was so excited when I told him mail man is here let’s see if Percy came and there it was!!! How fun!! :) I love these pictures. I've always wanted to have a train set like that with the big track and everything. Looks so fun! Aw, this brings back memories! My son was obsessed with Thomas The Tank Engine when he was little! What a very cool train set!! My Grandson is at the Thomas Train age now. He has quite the collection. i know "percy" rosey! really! 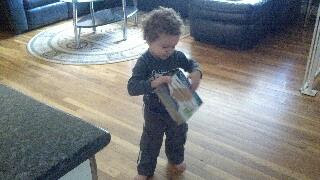 my son when he was a little younger, he was obsessed with thomas and friends, that's why i know percy, lol! 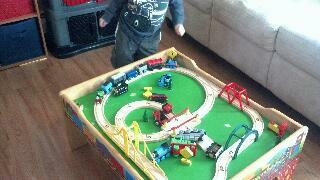 Those Thomas the Tank toys are a huge hit with boys! I just wish they weren't so darn expensive!